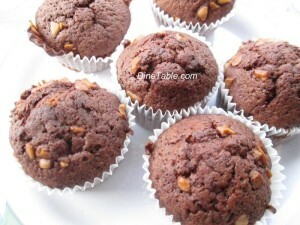 Chocolate Cupcake ( ചോക്ലേറ്റ് കപ്പ്‌കേക്ക് ) is a tasty snack and one of the favorite item for children. This is a sweet item can served in special occasions like birthdays, wedding party, festivals like Diwali, Eid, etc. it can used as a tea time snack or nalumani palaharanam with a hot tea. This cake is very easy to prepare within minutes. The ingredients for this recipe are easily available in the nearby supermarkets. Try this simple snack in your kitchen and enjoy the delicious taste. First of all preheat the oven to 375 degrees. In a medium size bowl, mix the cocoa powder and boiling water. After that let it cool them at room temperature. In another bowl gently mix the salt, baking soda and flour together. Beat the butter and sugar together with handhold electric mixture and keep aside. Add eggs and mix it smoothly. After that beat the vanilla extracts. Now add flour mixture into the beaten butter & sugar mixture and beat until totally incorporated. Then add cooled cocoa mixture, crushed cashew nuts and mix until smooth. After fill the muffin cup with batter and bake for 15 minutes. It should not be over bake because the cupcake will be dry. After 15 minutes take the cupcakes from oven.